SignatureSurveys.com looks like a normal survey site, where you can sign up and earn by sharing your opinion. But is Signature Surveys a scam, or is it really an easy way to earn money online? I have joined and tested the site myself. Let me reveal right away that there are some things you are not told before joining. In this Signature Surveys review I will give you an inside look, so you can see what you will really get after you join, so you will know this before giving away your personal details to sign up. What is Signature Surveys and what does the site offer? Signature Surveys claims to be a site that gives you access to different ways of testing products and giving feedback and earn money online like this. I first heard about it, when I saw a link to it on the site SurveySheep – this made me a bit suspicious from the start, as not all sites promoted there are worth joining. But I decided to give it a chance and test it out for myself. In its own words, it is focused on providing quality offers to its members, as you can see from the statement from the website below. According to Signature Surveys, they will present the best offers to you – I strongly disagree. This might make you think that it will really give you some great opportunities. However, in my experience and opinion the offers you will get can not live up to statement from the website above. But let’s take a closer look at what you will get, if you join, so you can judge for yourself. 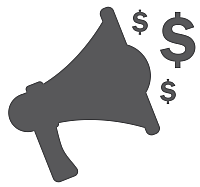 Once you get to the members area of Signature Surveys, you will find some paid surveys and offers. There is a long way to the members area, but I will explain more about this in the spam warning section later in this review. Let’s for now focus on the surveys and offers you will get access to, once you are a member. There is really not a lot of offers. 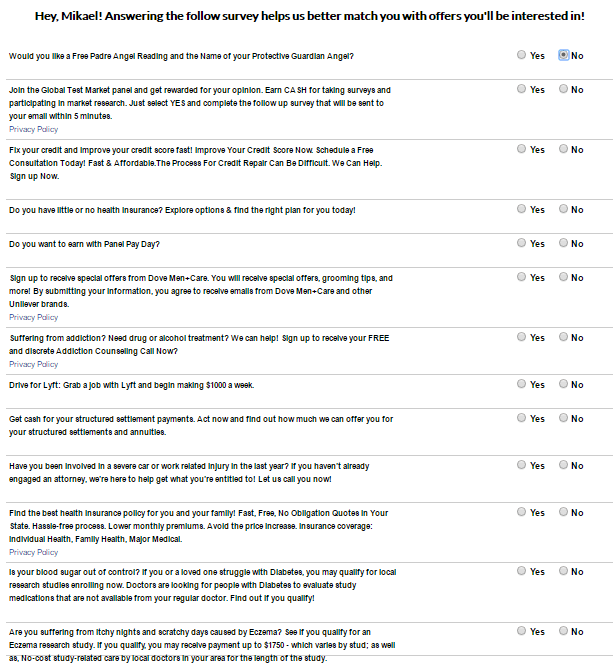 Below you can see a screenshot of all the surveys and offers, I had access to. The few offers I got after joining Signature Surveys. On survey sites the offers in general come and go, so it is not unusually not to have more offers than this. However, I have tried to login several times with days in between, and the offers just stay the same. The screen shot above is all the offers I had, and as you can maybe see from the image, there is not access to any surveys. Or there is one offer to a site called RewardBee. This is a real survey site, but when I clicked the link, I was just redirected to a guaranteed winner form that claimed I had won a great prize, if I just filled out my personal details. Some of the links took me to this spam offer. This has nothing to do with paid surveys or the link I clicked. 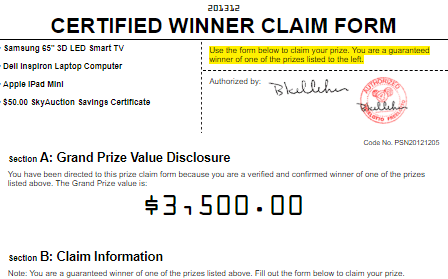 It is a spam offer that I regularly see online, and obviously I had not just won $3,500, a TV, or an iPad, as the form said I had. Very annoying to be redirected to links like this and not the offers promised. To SignatureSurveys defense, I have to say that some of the links did take me to the offer advertised, but many of the links took me to the form from the image above. You might get access to more or different offers than me, but in my opinion the selection I had access to was very poor. There was no chance to take surveys, and I just got access to a few offers, where I had to sign up and in many cases pay, to get a bonus. In general Signature Surveys seems to be mostly just a platform to promote other offers to earn commissions like this, and is in my opinion not at all focused on presenting the best opportunities, as it claims it is. I will show you even more reason this is my experience later. On Signature Surveys you can also earn money by inviting friends to join. You get a link you can share, and if people join through this link, you will earn $0.50. If you refer more than 50 people in one month, you will earn $1 per person instead. So this is a way to make some money on Signature Surveys. However, the reward for referring others is quite small, and you would have to refer a lot of people to make it worth it. In addition to this, you have to consider what you are really referring people to. If you are referring friends to a platform, make sure you actually really recommend the platform, and do not just promote it just to earn an extra $0.50. It will not be worth it, and if your friends find out it does not have much to offer, they will not trust your recommendations in the future. So before starting to promote Signature Surveys, be sure you know what it offers and that you truly think it is worth your recommendation. It is always nice to get a joining bonus, when you join a survey site, as it is easy money and gives a great start. Signature Surveys offers a joining bonus of $5, which is really high. You get a great joining bonus on Signature Surveys – maybe! Only few survey sites offer this high a joining bonus (Swagbucks is an example of another site that offers this). In addition to this, you are promised an extra $20 bonus opportunity after you join. This is great, BUT not really a good reason to join in my opinion. First of all, I have never received my $5 bonus. My account is still on $0 after having been a member for a few weeks. Usually I would of course reach out to support and try to get the bonus. In this case, I however know I am not interested in using Signature Surveys further, after having seen what it offers, so the $5 will not do me any good anyways. But if you join, just be aware you have to keep an eye on the bonus and try to get it, if you do not get it automatically. Also, the $20 extra bonus opportunity of course sounds great. It is however not as easy as it might sound. To get this bonus, you have to take 8 offers you are presented to after you join. You have to take a lot of offers to get your extra bonus. 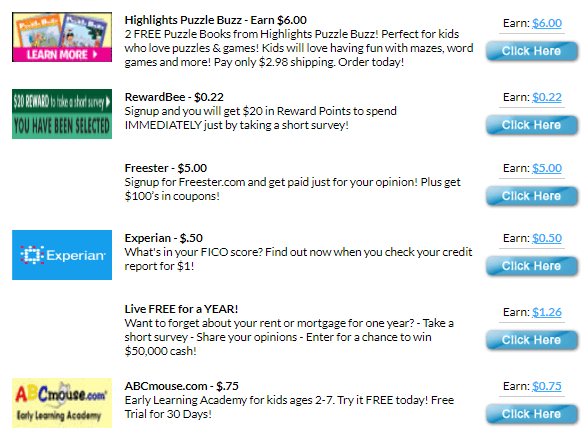 You have to sign up for every single one of these offers to get your $20 bonus. As far as I can see, all of them are free to sign up for, and several of the sites on the list are great and legit survey sites. It will however take you some time to sign up for all of them, and some of the sites on the site are definitely NOT worth joining and can give you a lot of hassle. You for example have to sign up for Survey Voices, which I have previously reviewed and revealed how much spam you will receive, if you sign up for it. In my opinion it is not worth taking these 8 offers to get the bonus. Your time is better spent on the top paying survey sites, where you can take actual surveys and do not get all the spam. If you decide to become a member of Signature Surveys, you will get paid in cash for completing the offers there. I have not tried to receive any cash into my Signature Surveys account myself, as I did not find any offers that I wanted to sign up for, as most of them would cost me money or lead to spam. Also, as already mentioned, I never received my joining bonus, so I cannot verify that you actually will get paid. But you are told that there are a couple of ways you can get paid, once you have reached the payout threshold. You can choose to get paid in check or through PayPal. Both a great ways to get your rewards, so that is definitely good these options are there. However, the payout threshold is $20. It is a bit high, but on some sites that is not a problem, because they have great opportunities. 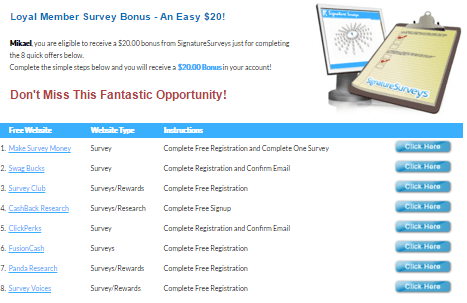 On Signature Surveys you can of course just take the extra bonus opportunity and make $20. But as I mentioned earlier, many of the sites you here have to join will lead to a lot of wasted time and spam in my experience. So even though you have a couple of great ways to get paid in cash on Signature Surveys, it might take you some time to actually get to the threshold, and might not be worth it. I have already given a few warnings about some of the offers on Signature Surveys. The most important thing to know is however what it takes to even get to the members area. In my opinion it is almost ridiculous what you have to agree to and go through to get there, and therefore I want to reveal this, so you know what you are getting into, before spending any time joining. Below I have made a video walk-through of the sign-up process for Signature Surveys, so you can see for yourself what you have to go through to get to the members area, and I will also show you the members area itself. You can also continue to read the details below the video instead. The first sign up form on Signature Surveys is easy to fill out like it is on most survey sites. However, you are already in the sign up form asked for a phone number. Very few survey sites ask for your phone number in the sign up process. A few ask later for verification purposes, but if it is not a site I know in advance is 100% legit, I am careful about giving up my phone number already when joining. And I am very glad I was careful when it comes to Signature Surveys and did not give my phone number – I will show you why in a minute (Tip: you can join Signature Surveys without a phone number, if you just leave the box blank). Once you have signed up, you are presented to some questions. You have to answer a lot of questions in the joining process – they are really just promotional offers. It is presented as a way to be able to better match opportunities for you in the future. It is normal having to fill out a profile on survey sites to help with this. This is just not the purpose on Signature Surveys – there is an ulterior motive. Every single question is really an offer they get paid a commission to promote. If you answer yes, you will be asked to sign up for some kind of offer or give your email or phone number for the company having that offer. It is nothing like a profile questionnaire you get on other survey sites, but just a long list of offers they try to promote to you. The image above show the first offers I was presented to when joining. There was another 3-4 screens with the same kind of offers I had to go through to move on. After these long pages with offers, the next step was several pages with just one offer – again presented as a question, and if you show interest, you are taken to a place you can sign up for the offer. When I finally got the end of all the offers, something happened that you have to be very aware of. You have to confirm the terms. This is very normal, but on Signature Surveys, you have to also confirm that their marketing partners can call you. Be aware you have to agree to get phone calls from marketing partners to join. If you click the marketing partners in the terms, you get a list to see their partners. I did this to check, and I saw a list of probably more than 100 partners. This means that if you agree to the terms, you agree that more than 100 partners can give you promotional calls. This is something you definitely need to be careful about and really consider before agreeing to. After this, I was presented to several more offers before I finally got to the members area. This is the longest sign up process I have ever tried for a survey site, and as you can see previously in this review, it is not even very good opportunities you get to, if you make it all the way through the sign up process and all the offers. If you are still interested in joining Signature Surveys, you need to know that you can only join, if you live in the US. There are so many great survey sites in the US, so if you live here, I do really not see any reason to join Signature Surveys, as there are so many platforms with better opportunities. I am sure you by now have figured out Signature Surveys is not a survey site I recommend. But let’s sum up the pros and cons, so you can get a better overview and decide for yourself, whether it is worth joining or not. Overall, Signature Surveys seems like a site that is not created to give you information about great opportunities for you, but more created just to promote as many offers as possible, so the owner can earn commissions. Nothing wrong with earning commissions, but in my opinion the quality of the offers on Signature Surveys is very low, and that you have to agree to receive phone calls from around 100 marketing partners is ridiculous. In addition to this, it is the longest sign up process I have ever gone through for a survey site, and the way the offers are presented as questions to help you but are really promoting, is in my opinion misleading, and something you have to be aware of. If you want to earn some extra cash by taking surveys there are many great survey sites with good opportunities. You can fro example check out the best survey sites in your country here – all of these are worth your time and have a sign up process that is a lot faster and without spam offers. Hope this has helped you find out, if Signature Surveys is for you or not. If you have any comments, questions, or have any experiences with Signature Surveys yourself you would like to share, I would love to hear from you in a comment below. Signature Surveys is seemingly a normal survey site. It does however not have any real good survey offers, there are a lot of questionable offers on the platform after you login, and the sign up process is extremely long and promotional – you even have to agree to receive phone calls from MANY marketing partners. Definitely not a survey site I think is worth the time.